You Want To Sell Toys On Amazon, But Keep Seeing “Restricted Brand” or “Restricted Category”, Right? One of my favorite categories to sell in on Amazon, ESPECIALLY during Q4, is Toys. Unfortunately for many new sellers, they find themselves locked out from being able to sell many of the popular toys on Amazon. Either because they are restricted in a subcategory (confusingly called) Toys. Or, because they are restricted from specific brands like Mattel, Hasbro, Marvel and more. Luckily, Amazon has given specific instructions on HOW to get ungated to sell in the TOY category as well as what is needed to be able to sell some of the restricted brands. I say SOME because not all of the big brands can be ungated for “regular” sellers like us. If you are tired of seeing the red RESTRICTED banner when you scan otherwise profitable toys, then read on. Because Brittany and I have put together a training workshop that will walk you through the process of getting rid of that frustrating notice. Getting Ungated In Toys And Popular Toy Brands Is Easier Than You May Think! First, being restricted in the subcategory of Toys. I know this one is confusing because the main category of toys is not restricted. But, Amazon did a tricky thing and made a subcategory that holds a lot of toys and restricted that subcategory…And they also named it Toys. UGH! I know, frustrating. Second, a lot of the big brands have requested that Amazon only allow approved buyers to sell their toys. What do you NEED to get ungated / unrestricted to sell toys on Amazon? In order to get unrestricted from selling toys and popular toy brands on Amazon, you need 2 things. A CPC (Children's Product Certificate) for one of the toys you want to sell. An invoice from a reputable wholesaler showing an adequate amount of toys purchased from them. Good News! We Can Help You Get BOTH Of These! 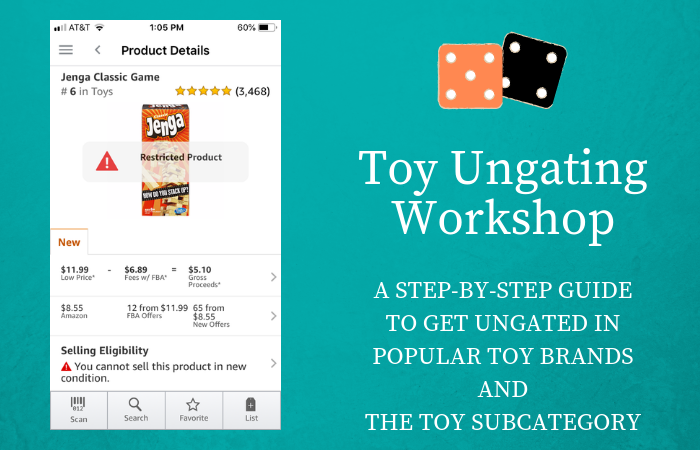 The whole purpose of this workshop is to show you exactly how to get ungated in the Toys subcategory and some of the top restricted brands on Amazon. After watching these videos, you will be ready to place your wholesale orders and request approval for the category and brands. Plus, we are here to help if you get stuck at any point in the process! We have a closed Facebook group just for students going through this process. If you get rejected or are having trouble with an order, Brittany is available to help you keep moving forward. I'd like to thank Brittany and Jessica Larrew for taking out their time and energy to produce this training. I have managed to successfully get ungated in 9 brands thus far in less than an hour from the application (and I spent under $450). Training has more than paid for itself and gotten me through a personal hurdle I have been struggling with in my Amazon business. I'm beyond thrilled and even have some items that I have been storing in my closet because I did not have the approval to list. Now I do! Ready To Get Ungated In The Toys Category And The Popular Toy Brands? Before purchasing this training, I want to let you know about a few things that you need to have in order to benefit from this toy ungating training. Thank you for helping us for ungating so many brands in Toys, Brittany! It has been a great training, and I am very grateful for everyone in this group. Thanks for the training, money well spent. Even with the frustrations dealing with Amazon, you made easy. Thanks so much for all of your help and hard work. You’ve done so much for us all. This has been a great class for me and I’m really glad I took it.